With it’s roots firmly established in Glasgow, IFA have been using their trained team of specialists to advise clients not only in the UK but around the world. After an initial meeting with Papertank, it was clear the direction that the website needed to move in and we were happy to help provide this. From day one on the project, we have been working closely with company director Chris Doak and Manager Kathleen Grant to coordinate the content strategy. Being careful to avoid the pitfalls of such an information heavy industry, our aim was to use larger dominant imagery to portray an atmosphere of the content on the page, with short punchy sentences to deliver concise details. 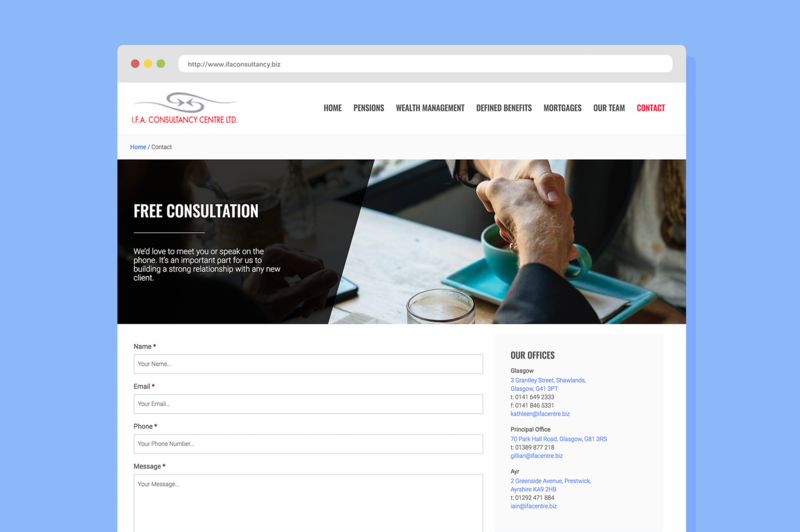 Good prompts and calls to action are always vitally important with websites such as IFA’s, so we implemented the tried and tested Papertank method of ‘Easy, Clear and Often’ when it came to ‘contact’ links. We believe that no matter where the user is on the site, or how far they’ve scrolled, when they are sitting on key piece of information a ‘get in touch’ link should not only be visible but the eye should be drawn to it by the structure of the page and the content itself. Our bold design, dynamic structure and simplicity helps deliver IFA a website that showcases their strengths and will stand out amongst a highly competitive market.